Fast Delivery. Great product! Fast Delivery. Great product! I needed this item as a last minute event celebrations for work. Product worked great and everyone enjoyed having their own little party popper to celebrate with! Took off the wrapper and wrapped with TNT label. Perfect favor for Minecraft party. Easy ordering. No problems with delivery. I would buy this product again . I would buy this product again . We received this product on time . 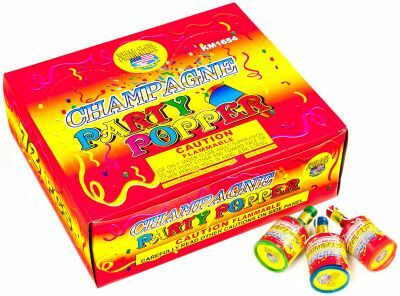 We enjoyed using them on New Years Eve. We used the product for a youth event at the church. All 100 students "popped" them at the same time. There were about 10 duds out of 100. So those students didn't get to feel a part of the group. We gave them new ones but the excitement wasn't the same. Merchant Response: We're very sorry to hear that some of your party poppers didn't work, and for the impact this had on the experience for your students. We've issued you a partial refund on your order. Thank you for taking the time to share this with us, because your feedback is invaluable in helping us improve our products and services. We look forward to serving you again in the future.